Windows Phone 8 wants to get all up in your business, but in a good way. Today, Microsoft officially launched the next version of its mobile operating system and revealed some new features that are aimed to make the smartphone more personal to you. Highlights included an app called Data Sense that will help users manage data consumption on their device, and Kid’s Corner, which lets parents create a personalized home screen just for kids. In addition, Microsoft finally announced pricing and availability dates for previously announced smartphones, including the Nokia Lumia 920, HTC 8X and Samsung Ativ S.
During the presentation, Microsoft CEO Steve Ballmer and Windows’ Joe Belfiore emphasized that Windows Phone 8 was designed to deliver a more personal experience to users, bringing one’s most important contacts and apps to the forefront. But whether there’s enough there to get consumers to fall in love with Windows Phone 8, when the OS has struggled to attract consumers in the first place, remains to be seen. 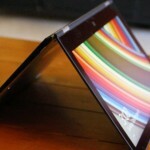 With Windows 8 finally launched, Microsoft is now turning its attention to mobile. Today, the company is hosting an event in San Francisco to spill the rest of the beans on the next version of its mobile operating system, Windows Phone 8. Over the past few months, the company has shared a few details about Windows Phone 8, including support for multicore processors and higher-definition screens, the addition of a Wallet hub, and NFC technology and data encryption. Several manufacturers have also introduced new devices, such as the Nokia Lumia 920 and 820, and the HTC 8X and 8S. But there’s still a lot that’s unknown about the key features of the software, so we expect to hear more about them today. There’s also a chance we’ll find out pricing and release dates for the previously announced phones, as well as some new handsets. Though Windows Phone received high praise from reviewers, and reports of good customer satisfaction early on, sales of handsets continue to be weak behind Android and the iPhone. At least Microsoft won’t have to fight Google for attention today. Due to Hurricane Sandy, Google had to cancel its New York Android event, originally scheduled for earlier this morning. Now in the main spotlight, can Microsoft convince consumers and developers that Windows Phone 8 is good enough to compete with Android and the iPhone? We’ll soon find out. Microsoft’s event is set to start at 10 am PT, so be sure to tune in then for AllThingsD’s live coverage. 9:56 am: Hey, everyone. I’m here at the Bill Graham Civic Auditorium for the Windows Phone 8 event. Just got seated. 9:58 am: Currently playing: “Floetic” by Floetry. Great song. If you haven’t heard it, get thee to your favorite music service and check it out. 10:00 am: Announcer says the program will begin in a few moments. 10:03 am: Lights go down. Here we go. Starting with a video about Windows Phone, narrated by Microsoft’s Joe Belfiore. 10:04 am: Belfiore is onstage, and asks Windows Phones owners to hold up their devices. I’d say about 20 to 30 people put their hands up. Guessing a lot of Microsoft and Nokia workers. 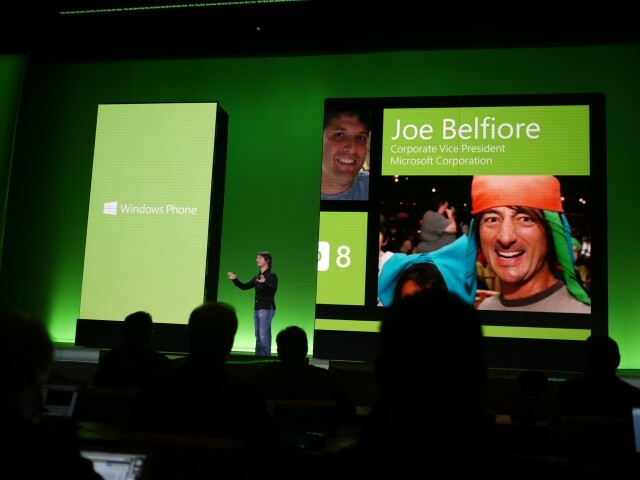 10:05 am: Belfiore: We want to introduce you to the new features and value of Windows Phone 8. He says it has been a significant project for the company. 10:06 am: Belfiore is talking about the new handsets from Nokia and HTC, and calls them some of the most beautiful devices they’ve had. There are currently 120,000 apps. 10:07 am: Belfiore says they are doubling language to support 50 languages and apps will be available in 191 countries. 10:08 am: Belfiore says static grid of icons hasn’t changed that much since the iPhone and Android. So Windows Phone wanted to come out with a new point of view. 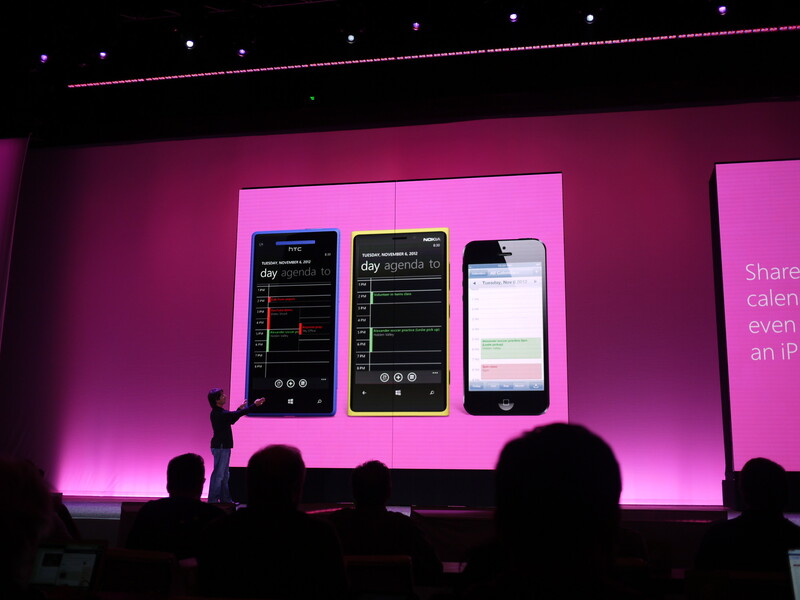 “We created a new way for people to connect with their smartphones.” People are at the center of Windows Phone, and not apps, Belfiore says. 10:09 am: When you put people in the center, you get a better smartphone experience. Now there’s a video showing this point. Starts with “We are not for everybody.” Sales of Windows Phone handsets seem to confirm this point. 10:11 am: We think Windows Phone is unlike any other mobile operating system out there today. It’s also the perfect companion for Windows 8 PCs and Xbox. 10:12 am: With Windows Phone 8, we’re taking live tiles further. You can now resize tiles. We heard about this earlier in June, at the Windows Phone Summit. 10:13 am: “Only Windows Phones have live apps.” Belfiore says they’ve tried to make apps more personal. Here we go: A new feature. 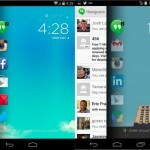 There’s now a lock screen that’s powered with live apps. 10:14 am: New lock screen will present things that are relevant to you, such as photos, sports scores or deal of the day. Belfiore is showing an example with Facebook. There will be a new Windows Phone 8-optimized Facebook app, which will surface photos from the social networking site. 10:16 am: Belfiore calls the Facebook photos “moments of delight.” How quaint. 10:17 am: Putting Facebook on the lock screen is just one example. 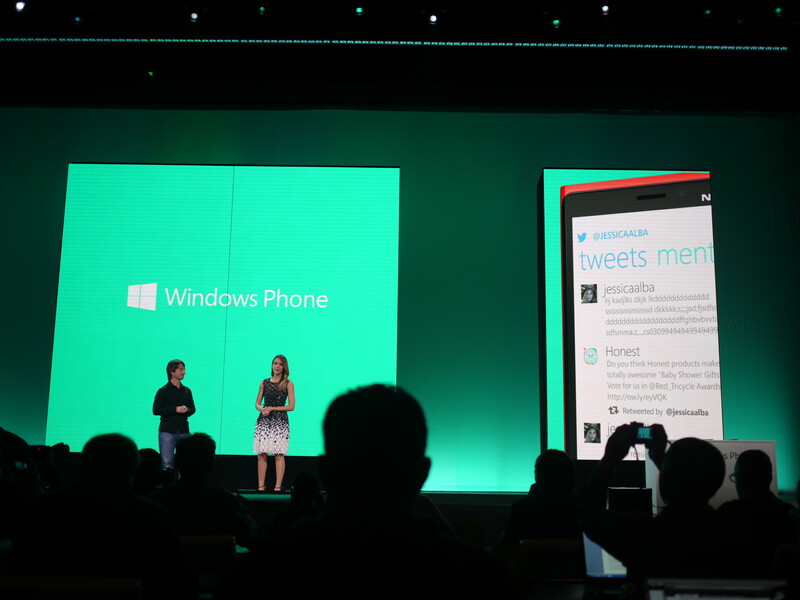 Belfiore says many of its developers are working on Windows Phone 8-optimized apps, including Twitter. Better notifications, new live tile and improved performance. 10:18 am: Now talking about Skype. Skype says it has reworked the apps, so runs all the time in the background without draining battery. Belfiore says Windows Phone 8 will have 46 out of the Top 50 apps available, which is “huge” for them. 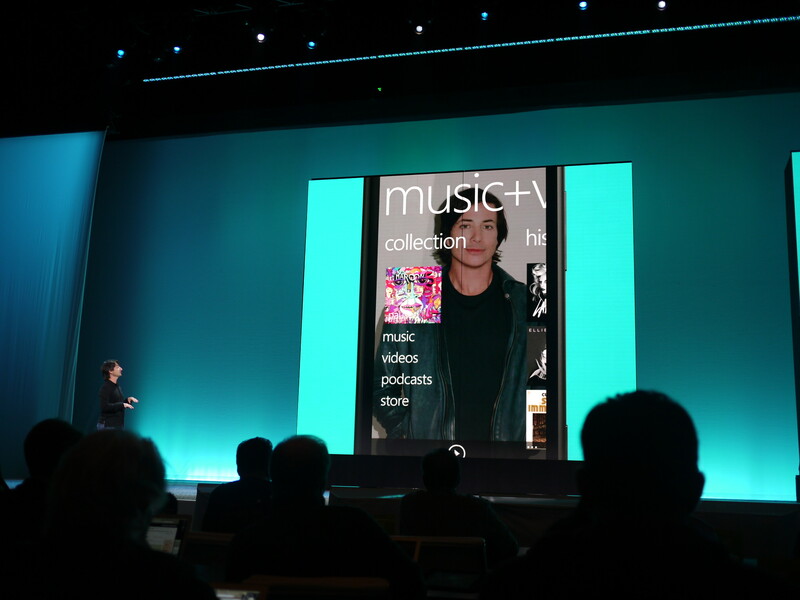 10:21 am: Pandora for Windows Phone 8 is coming in early 2013. Microsoft is including a free year of music, with no ads. A nice round of applause for that. 10:23 am: Belfiore is now talking about controlling data costs on smartphones. Data Sense is a new feature that will allow you to surf the Web more without eating up more data. 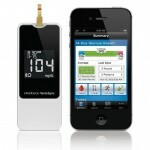 The system is built in the cloud and on the phone itself, and compresses every Web page to use less data. 10:25 am: Data Sense also helps find nearby Wi-Fi hotspots, and takes advantage of that connection instead of a cellular connection. You will also receive notifications when you’re nearing your monthly data limit, and it displays how much data your apps are using. Belfiore claims that Data Sense will give users 45 percent more Web browsing on the same data plan. Verizon will be one of the first carriers to support Data Sense. 10:28 am: The next feature is one of Belfiore’s favorites, he says, and it has to do with parental controls on the smartphone. 10:29 am: It’s called Kid’s Corner and creates a separate place on your phone just for your kids. 10:30 am: Belfiore’s three kids are now on stage to demo Kid’s Corner. Adorbz. 10:32 am: Kid’s Corner lets you simply check boxes for the games and apps in Kid’s Corner. The feature is really for parents. “If you’ll notice right now, the kids are really quiet,” says Belfiore. 10:34 am: Microsoft has tested Kid’s Corner with a number of users, including actress Jessica Alba. Oh, and here she is. 10:36 am: “I love Kid’s Corner. I think it’s awesome. My daughter, Honor, loves it,” says Alba. 10:37 am: Alba gives an example about her daughter getting on her phone and sending a tweet of jumbled letters. 10:38 am: Alba says her phone is an extension of her, and with Windows Phone, you can see everything that’s important to her. Belfiore notes that Alba had an iPhone before switching to Windows Phone, and asks about the transition. She was worried about her music collection, but all was well. 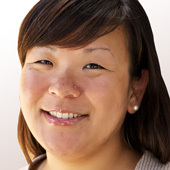 10:41 am: Hey, wouldn’t you know it, Alba’s company, The Honest Company, is working on a Windows Phone app. Alba says this has been the best tech crowd she’s ever been in front of … aww, shucks. 10:42 am: Moving onto the People hub. A new feature called “Rooms” lets you aggregate a group of just your closest friends and family. When you pan over in the Rooms feature, you can share location, calendars and notes with everyone in the group. Belfiore gives an example of sharing a grocery list with your family members. 10:45 am: Rooms will let you invite users even if they’re not using Windows Phone 8. The feature list will just be more limited. 10:46 am: Belfiore reiterates that with all the features of Windows Phone 8, Microsoft has really tried to make the smartphone more personal. 10:47 am: Moving on to SkyDrive. “SkyDrive is the full cloud service with Office built in. You should think about your phone, tablet and PC together,” Belfiore says. With SkyDrive, you can work on a document on one device, and pick up where you left off on another device. 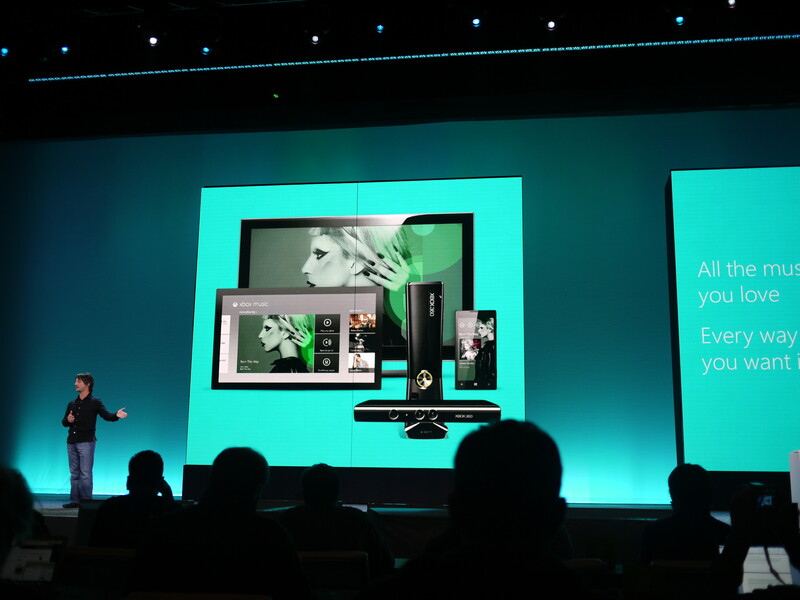 10:49 am: Phone photos are automatically available in full resolution on your PC, via the cloud. SkyDrive offers seven gigabytes of free storage, the most of any service, Belfiore claims. iCloud only lets you store photos for 30 days, but SkyDrive lets you store photos for as long as you want. 10:51 am: Last topic they’re going to talk about is music. XBox Music offers unlimited music across all devices. Windows Phone 8 will allow you to transfer your iTunes library to the software, so you don’t have to worry about losing your catalog, says Belfiore. 10:53 am: Belfiore has finished up his portion of the presentation, but we’re now hearing Steve Ballmer’s voice, as a video plays. And here he is! 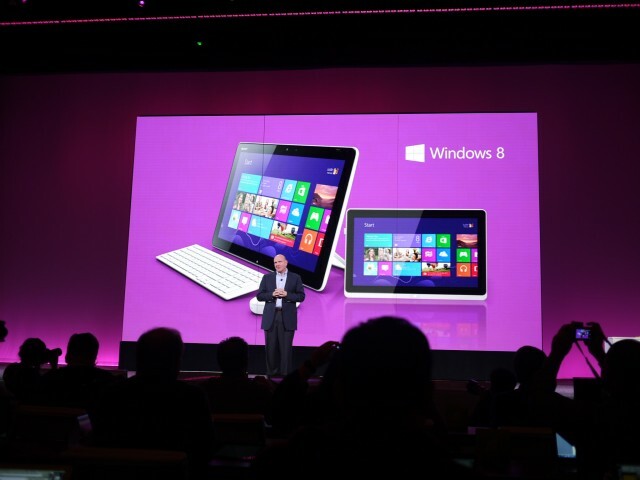 10:55 am: Ballmer says they have seen great response to Windows 8 and the Microsoft Surface over the weekend. 10:57 am: Ballmer is pretty subdued today. Maybe too much Windows 8 excitement over the weekend. Microsoft account will give you access to the entire ecosystem, and developers will be a part of that. Interestingly, I’ve talked to a few developers over the past couple of weeks, and they said they’re waiting a little while longer to see how the OS does. 11:00 am: Moving on to hardware. Ballmer’s showing off the Nokia (he pronounces it “NOCK-ia”) Lumia 920, which was introduced a couple of months ago. 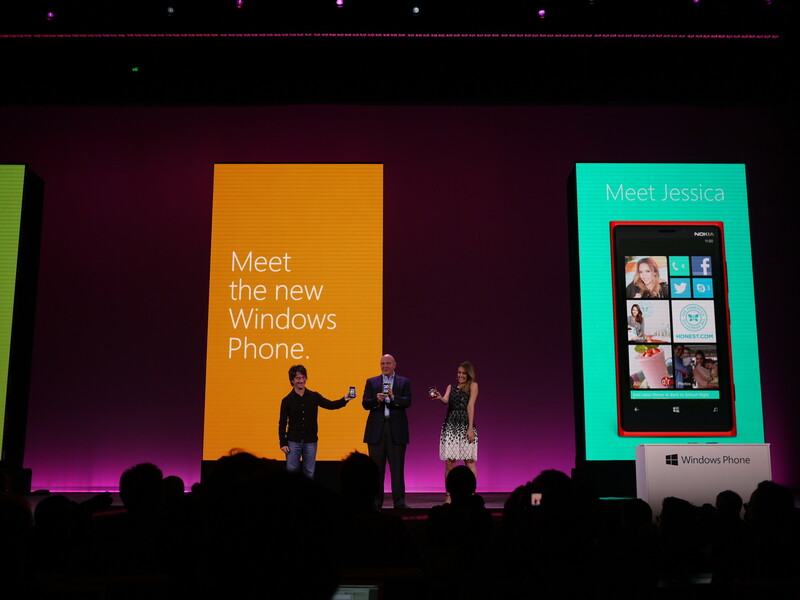 11:01 am: HTC 8X and 8S are also two Windows Phone devices announced earlier. Devices will go on sale in Europe this weekend and will continue to roll out in the coming months. 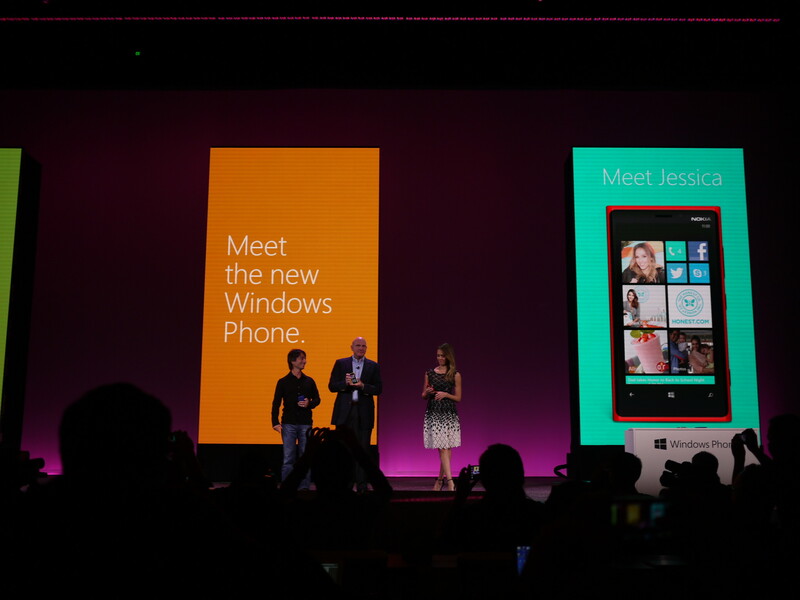 In the U.S., Verizon, T-Mobile and AT&T will offer Windows Phone 8 devices. Verizon will offer the HTC 8X and Nokia Lumia 822 for $199.99 and $99.99 with a two-year contract, respectively. Both will be available on Thanksgiving. Meanwhile, the Samsung Ativ Odyssey will be a Verizon exclusive and will be available in December. 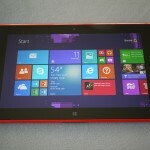 AT&T will carry the Lumia 920, Lumia 820 and HTC 8X — all are set to go on sale in November, but pricing will be revealed closer to launch. 11:04 am: T-Mobile will offer the Nokia Lumia 810 for $99.99 on Nov. 14. Meanwhile, the HTC 8X will go for $149.00 for the 16GB model, and will also be available on Nov. 14. All Microsoft stores will offer all phones. Between Windows 8, Microsoft Surface and Windows Phone 8, you won’t be able to turn on the TV or read a magazine without seeing a Microsoft ad, says Ballmer. Yay? 11:07 am: “People all over the world are about to fall in love with Windows Phone. It has incredible software, and is the most personal smartphone,” says Ballmer. 11:09 am: Oprah moment! 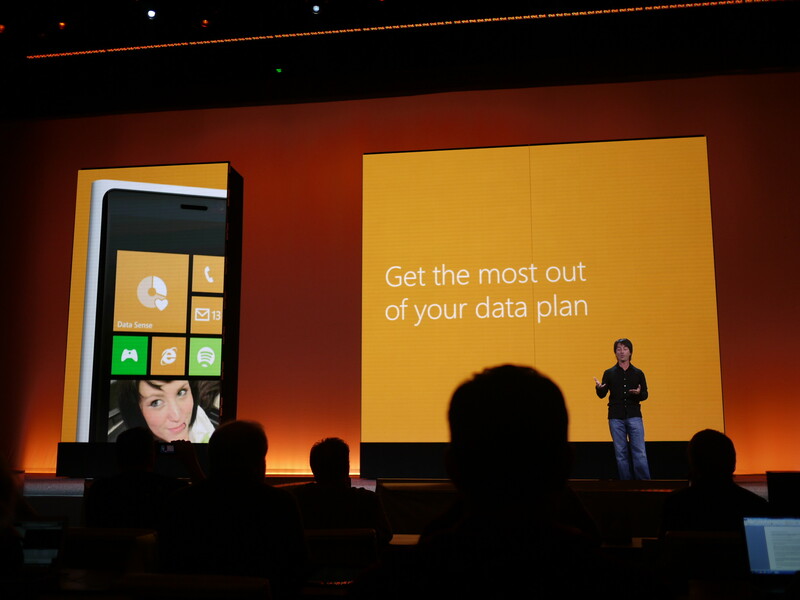 Everyone in the audience gets a Windows Phone 8 device. 11:10 am: Okay, that’s it for the event. Thanks, everyone, for joining us today! Time to fight the crowds for some hands-on time with Windows Phone 8.